One of his most complex and mysterious perpetual motion devices of Leonardo is found on two pages from Manuscript B: 33v and 34. It has never been deciphered or built, until now. The boxes make up the principle element. Though Leonardo did not specify this, it follows logically that these were meant to contain a “fluid” weight: sand, small steel balls, water or mercury. Let’s imagine water being used. The water would move inside the boxes as they rotate around the large wheel. The boxes complete half a turn for every full turn of the main wheel. A mechanism below returns the boxes that rotate in an anti-clockwise direction to the “start” position. 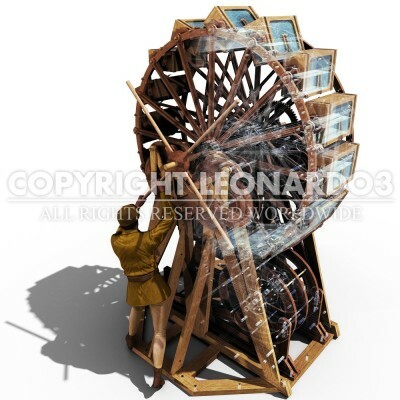 The system would be insignificant if it weren’t for the ingenious and complex hitching system devised by Leonardo. In fact, hidden at the sides of each box are springs and pivots that allow to program and control the position of the boxes to make them all perpendicular on the right and oblique on the left, which in turn makes the liquid inside them shift to the left. This unbalancing of weights to the left moves the center point of the total mass to the left. This would set the wheel rotating by itself in an anti-clockwise direction, thus creating motion and energy out of nothing! This fairly large and complex machine should be able to generate spontaneous motion through the unbalancing of the boxes to the left. Such motion would become perpetual, thus not only ensuring its ability to function ad infinitum but also allowing its energy to be used for other purposes. 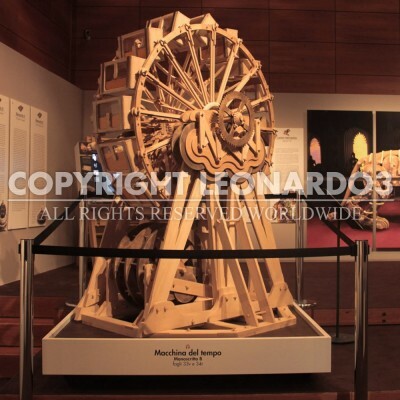 We use the conditional tense here because in fact friction would prevent this machine, like all other perpetual motion machines before and after Leonardo, from actually working. What could a machine like this be used for? Such a well-balanced system could have powered the infinite winding of a watch. Leonardo’s design could therefore have been for a time-measuring machine that would never stop working. In other words, a Time Machine!